Our next destination was Gendarmenmarkt, which is a block behind Bebelplatz (the place where the Nazi Book Burning occurred). 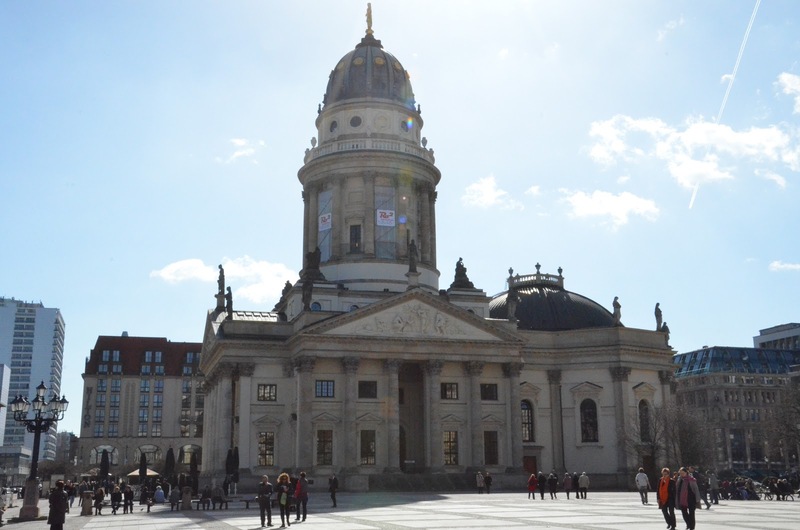 Gendarmenmarkt is one of Berlin’s loveliest city squares. 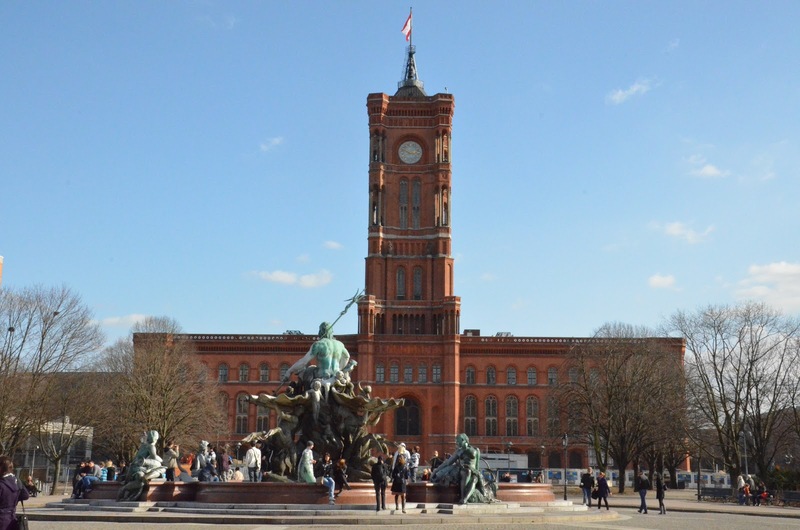 This square is surrounded by three architectural gems: the Konzerthaus (concert hall), the French Cathedral (Französischer Dom) and the German Cathedral (Deutscher Dom). The Doms or ‘domes’ refer to the domes atop the two cathedrals, constructed in1785. As Prussia had a religiously welcoming policy, the cathedral provided exiled French Protestants (Huguenots) a place to worship. 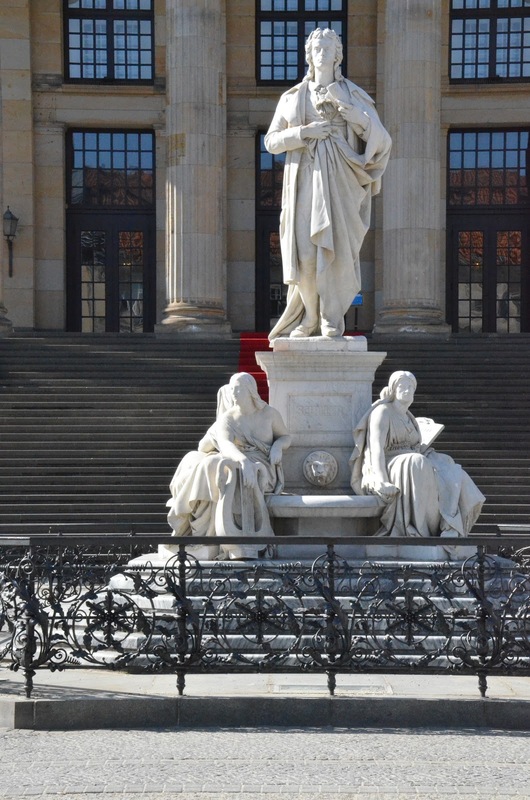 In front of the Konzerthaus is a statue of German poet Friedrich Schiller. The rest of the square is a wonderful place to do something Germans love to do– sit in the open air and talk over drinks. There is a very nice open air cafe/bar –as this is a revitalized upscale urban area. 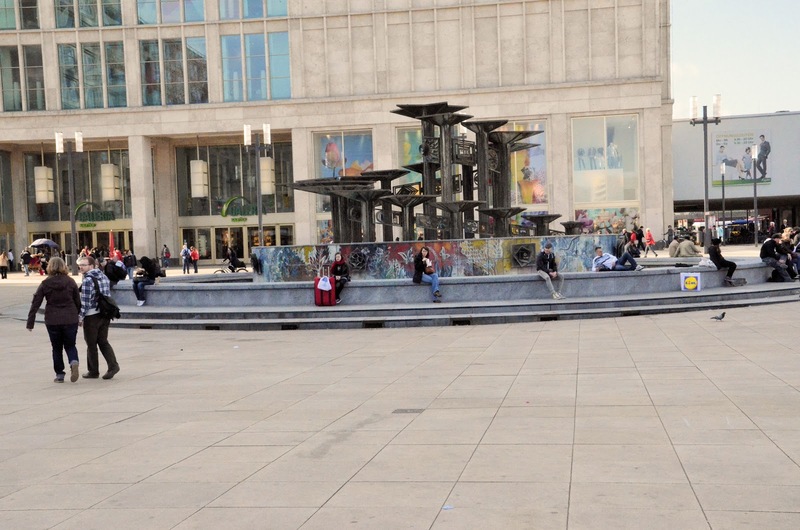 This square is also home to one of Germany’s famous Christmas markets during the Advent season. We even discovered a Christmas store across the street facing the square with all kinds of traditional German Christmas collectibles and handmade German lace. From here, we headed back to Unter den Linden. As Unter den Linden crosses over the Spree River, the street name changes to Schlossplatz (Palace Square). This is where the State Palace (Stadtschloss) once stood. The Stadtschloss (State Palace) was the winter palace of the Hohenzollern Kings of Prussia (and later, the Emperors of Germany) from 1701-1918. The East German government demolished it in 1950 due to extensive damage from Allied bombing. In 1976 the GDR (East Germany) built the Palast der Republik (Palace of the Republic) on the same grounds. 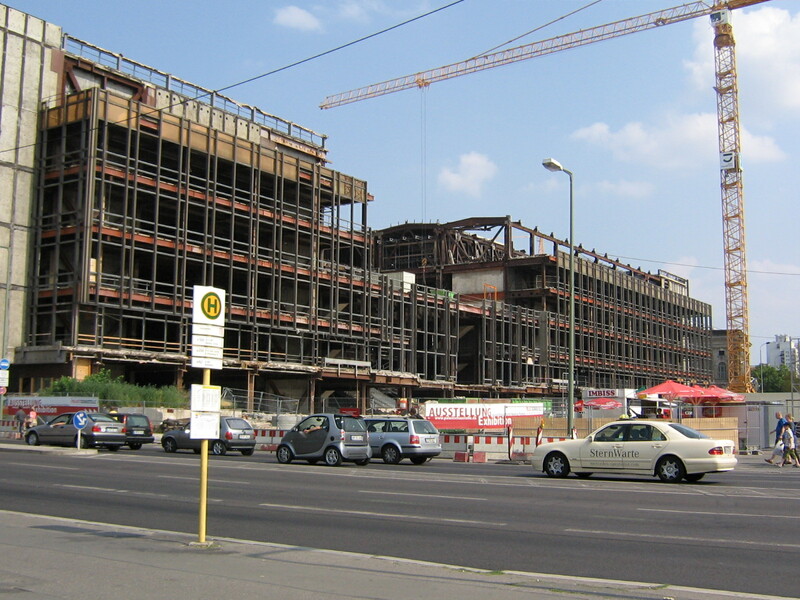 However, the Palast der Republik had not been used since 1990 when it was found to have asbestos. 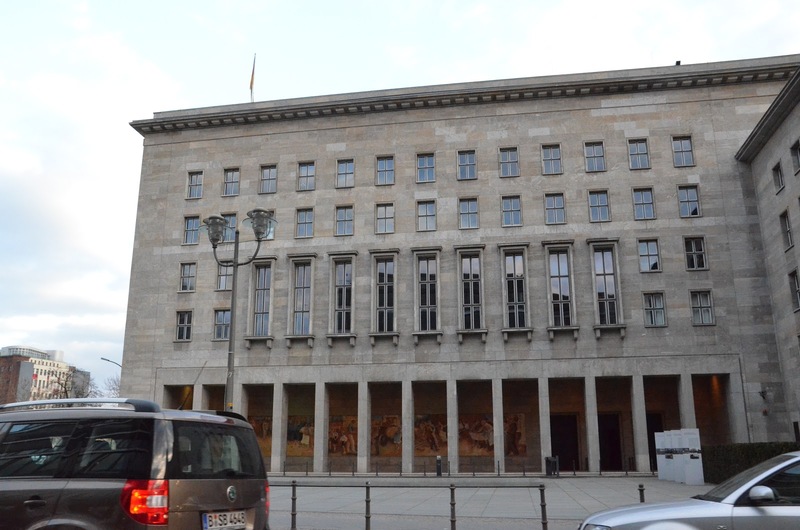 Although the asbestos was removed by 2003, and many of the locals desired for it not to be destroyed, the German Parliament decided to have it demolished. Deconstruction of the Palace was completed in 2008. 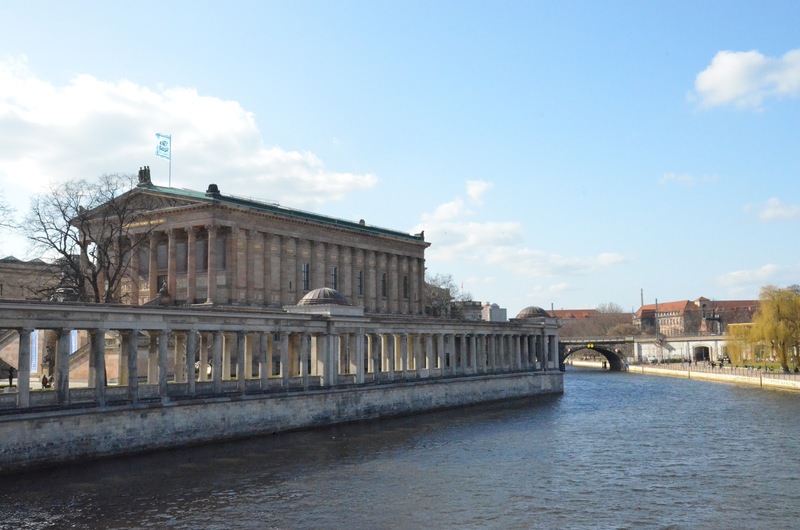 When you cross over the Spree River, not only have you crossed over to the area where the former palace stood, you have also arrived at another of my favorite places in the former East: Museum Island. I love history and art, so when I was in Berlin in 2006, my hubby and I purchased 3-day museum passes. We really could have spent several days but we had limited time and the museum I most wanted to see–the Altes Museum (Old or Ancient Museum) was being refurbished. This island houses some of the best museums in the world, with some of the greatest art collections of Antiquity. The Ishtar Gate, the bust of Nerfertiti, parts of the Pergamon Altar and Rodin’s The Thinker (an original and much smaller than the one in Paris) are a few of the seemingly endless treasures housed on Museum Island. My favorite museum is the Pergamom Museum. Unfortunately, neither my sister nor daughter remembered to take a picture of it. 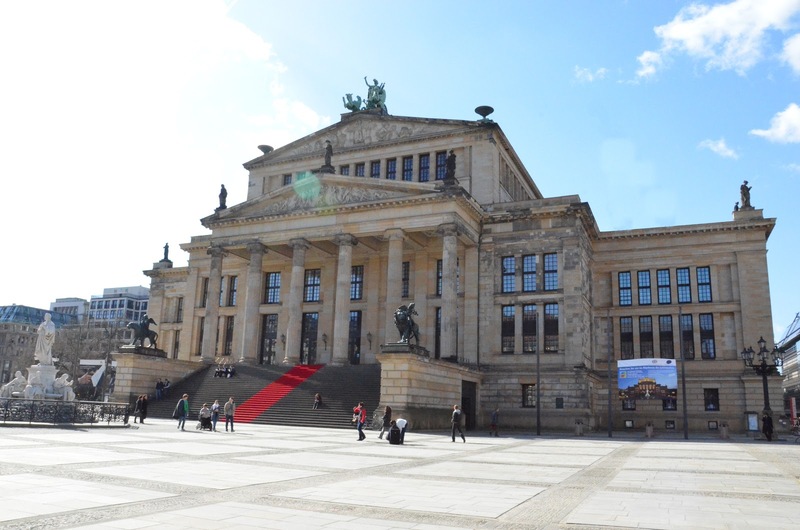 The Altes Museum, a UNESCO World Heritage Site, may be the most recognizable of the Berlin museums, because Hitler used it extensively in propoganda– imagine Nazi flags hanging between each column and the little dictator spewing hatred from a podium on the front steps. 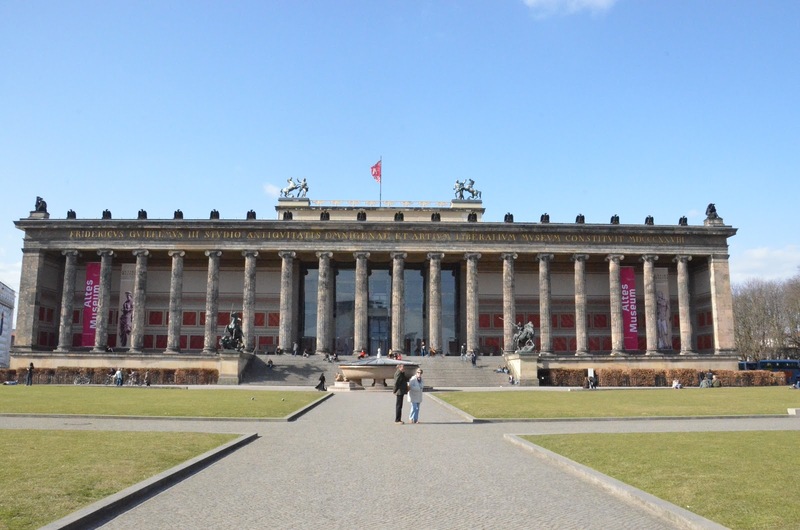 A wide plaza, called the Lustgarten (pronounced loost-garten) (Pleasure Garden) lies in front of the Altes Museum. 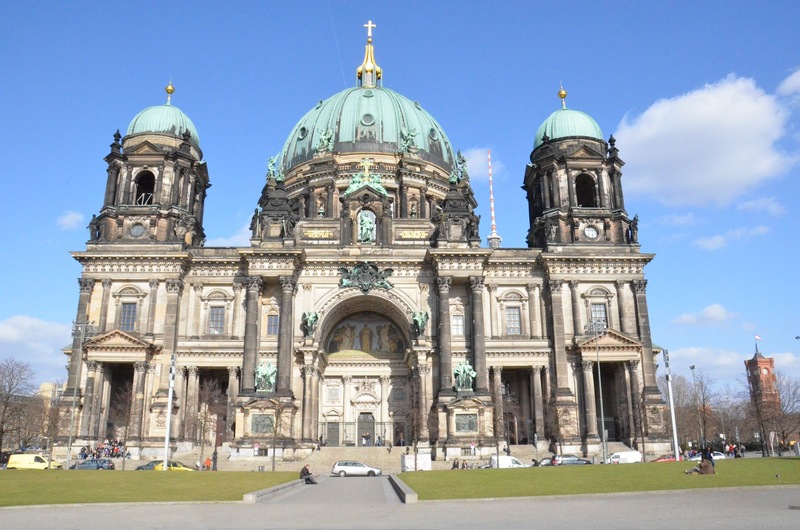 Perpindicular to the Altes Museum is the Berliner Dom (Berlin Cathedral)– it also looks out upon the Lustgarten. 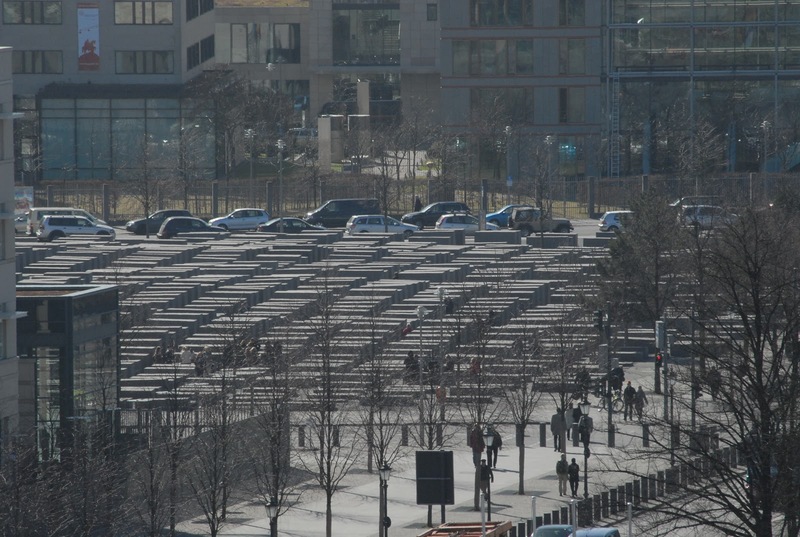 Hitler often used the wide flat Lustgarten for his propagandistic parades. 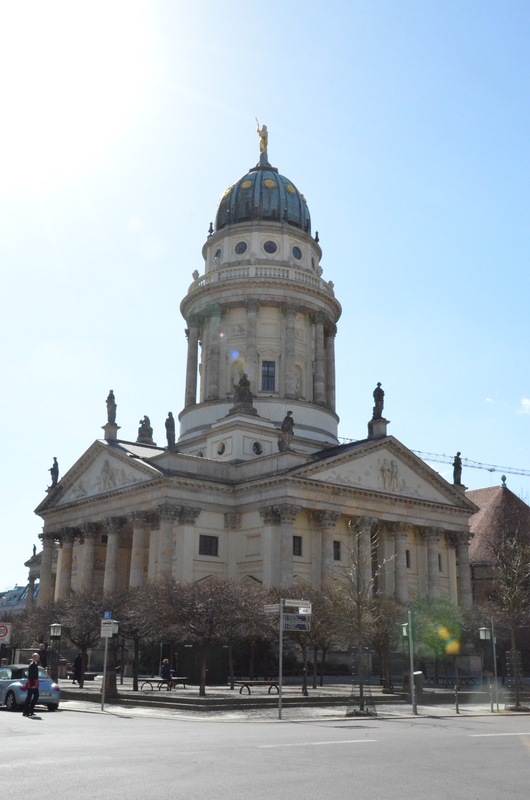 The Berliner Dom, a huge structure once served as the personal chapel for the Hohenzollern royal family. Services are still held here. Though its name indicates that it is a cathedral, it has never been the seat of a bishop, and is not a Catholic chapel, but a Protestant church. Continuing east past the Berliner Dom, Schlossplatz becomes Karl-Liebknect-Straße which leads to the famous Alexanderplatz. 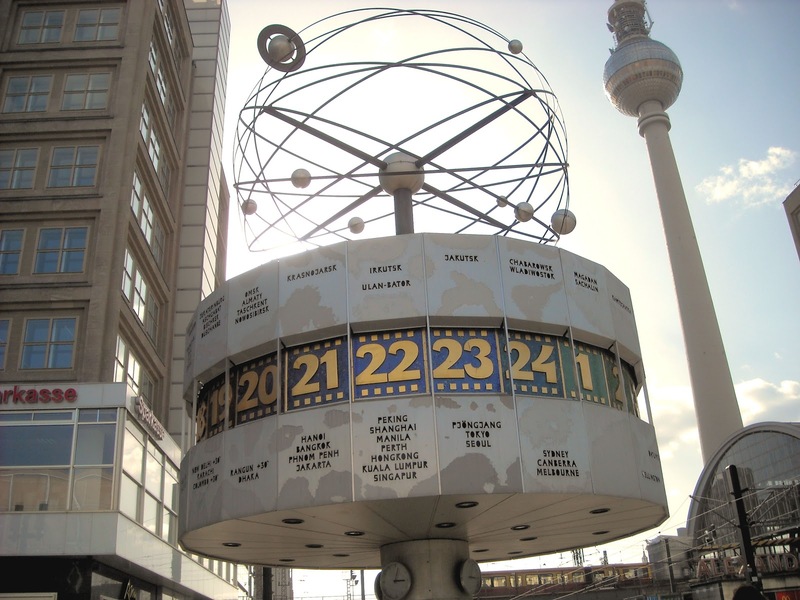 If you’re a Jason Bourne fan, you have seen Alexanderplatz in the Bourne Supremacy. Remember when Jason abducts Nicky from the bright yellow tram during the sudden demonstration in the platz? The writer who scripted this must have been familiar with how suddenly demonstrations occur in Berlin –and indeed Germany– it is quite common for a demonstration of (mostly) young people to suddenly pop up. It happened when I was visiting Berlin in 2006 with my husband for my high school reunion. We were at the famous Checkpoint Charlie, when suddenly a large group of people began what appeared to anyone unfamiliar with these events, to be a parade. However, it was a parade of people and signs interspersed between some cars and trucks with people hanging off the front and sides holding more signs. It used to happen all the time during the 80’s when we lived here during the Cold War. Except, during our time living in Berlin, these demonstrations were most frequent in West Germany, namely Frankfurt. The Soviets would not have tolerated demonstrations in the East, when they did happen, they were crushed violently and decisively. The famous 17th of June Uprising, which was put down by Soviet and East German troops, is now commemorated by the street of that same name: Straße des 17. Juni (17th of June Street). It is the western continuation of Unter den Linden, on the west side of the Brandenburg Gate and as I mentioned the place we parked our car before walking to the Reichstag earlier this day. 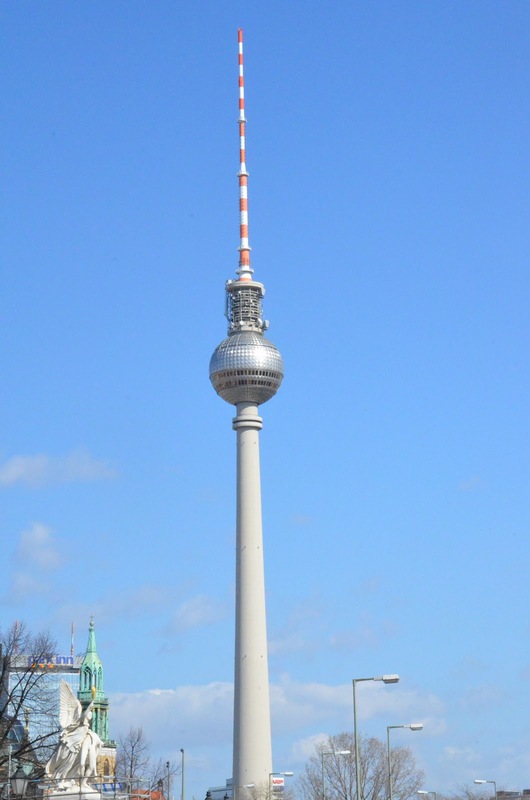 Of the many structures worthy of visiting in the Alexanderplatz area, the one most noteworthy to me is the Fernsehturm, or Radio Tower. The Radio Tower was built by the Soviets in the late 60’s; at 368 meters (a little over 1200 ft) it is the tallest structure in Germany. Despite the atheistic government’s intent– that it stand as a symbol of East Germany’s might, it ended up representing quite the opposite. For, as you can see in the picture to the right, when the sun shines on it, a cross appears on the dome. No matter what they did– applying paints and chemicals–they could not keep the symbol of the cross from appearing. President Reagan referenced it in his “Tear down this wall” speech on June 12, 1987. As he pointed out, despite the Soviet intent to build a structure that would tout their dominion, they had failed in every attempt to rid the tower of this ‘flaw.’ It would seem that God was taunting them with a reminder of His ultimate authority over the futile efforts of man to deny His existence. The German people have dubbed it the Pope’s Revenge. 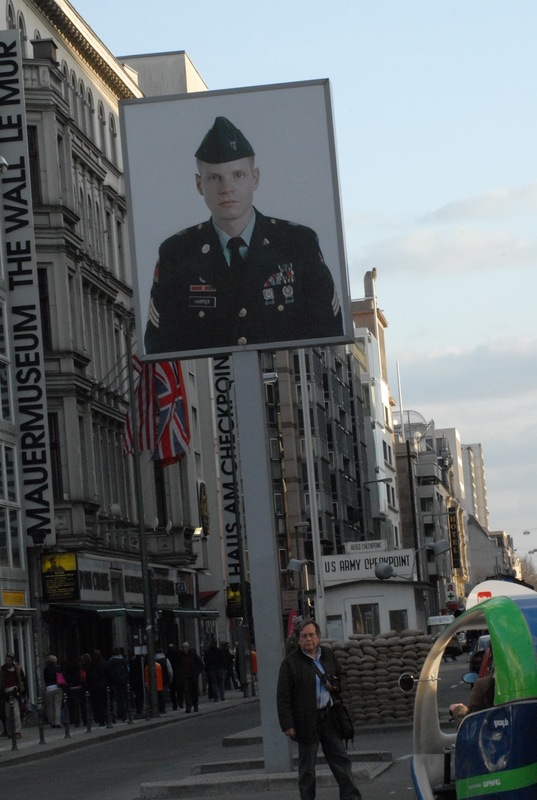 Our next stop was Checkpoint Charlie, which is quite a ways from Alexanderplatz so we drove to Friedrichstrasse. Checkpoint Charlie is the most famous Berlin border crossing. This was a crossing between East Berlin and West Berlin, not between West Berlin and East Germany (big difference). 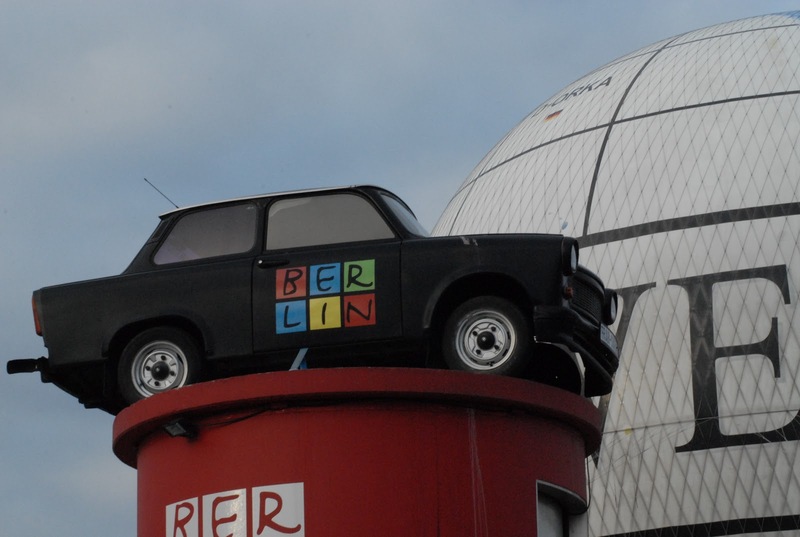 Anyway, when we lived in West Berlin, this was the only way we US citizens were allowed to enter East Berlin to go on day trips/shopping trips. We had to have an ‘East Pass’ which was a special document with our picture on it and was a yellowish card folded in half– I used to work in the East Pass office my last summer in Berlin after graduation. They were a type of travel visa. You could not go between the two parts of the city without it, and you better not lose it or give it to anyone other than the border guards. I don’t have any good pictures of Checkpoint Charlie from this trip. My sister and daughter seemed to have been too preoccupied with other things. My daughter was on the hunt for a Berlin souvenir bag with her college colors– which we finally found at a shop across from the Checkpoint Charlie Museum. And my sister was busy haggling with the Russian guy who sold ‘authentic’ East German passport stamps. I didn’t have a camera, so I assumed they were going to do their jobs and get good pictures! 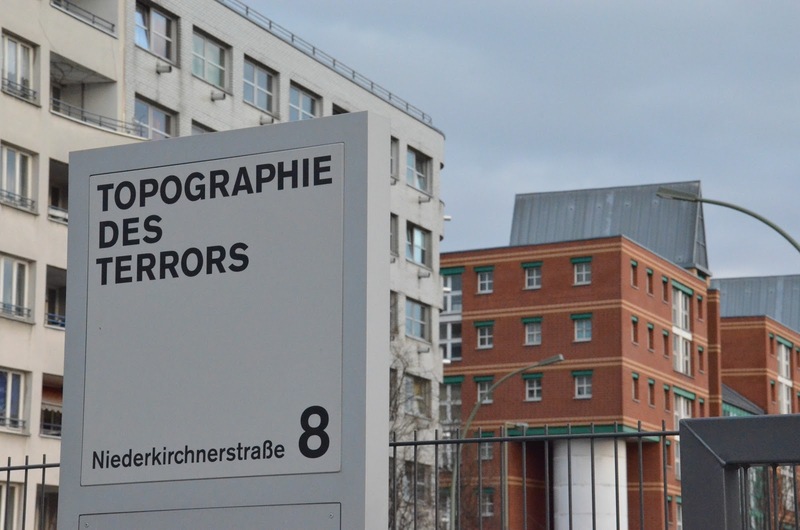 After rejoicing over finding the bag (we had literally searched 10 shops before this) and getting our passports stamped, we headed west about a block away to Niederkirchnerstrasse to the Topographie des Terrors (Topography of Terror). 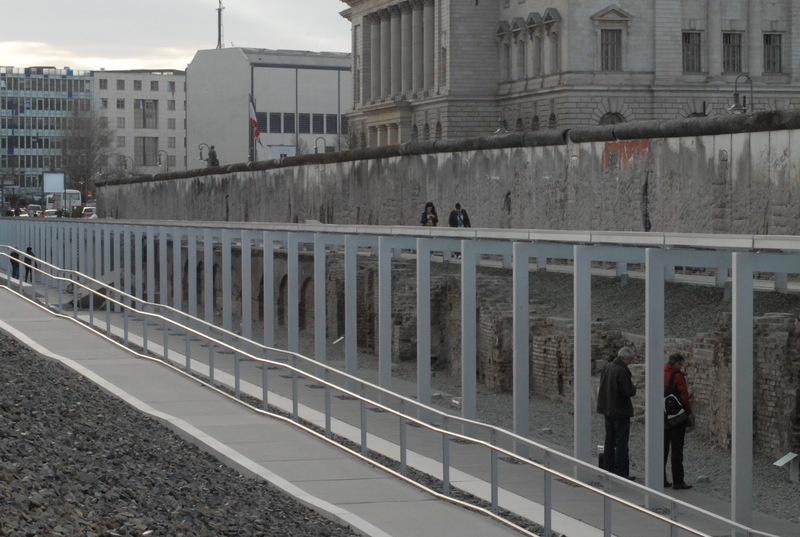 Topography of Terror is an open air museum on the site of the former Gestapo and SS Headquarters. The buildings that once stood here were mostly destroyed by Allied bombing. What is left is the longest extant remnant of the outer Wall and parts of the basement where prisoners were held and tortured. 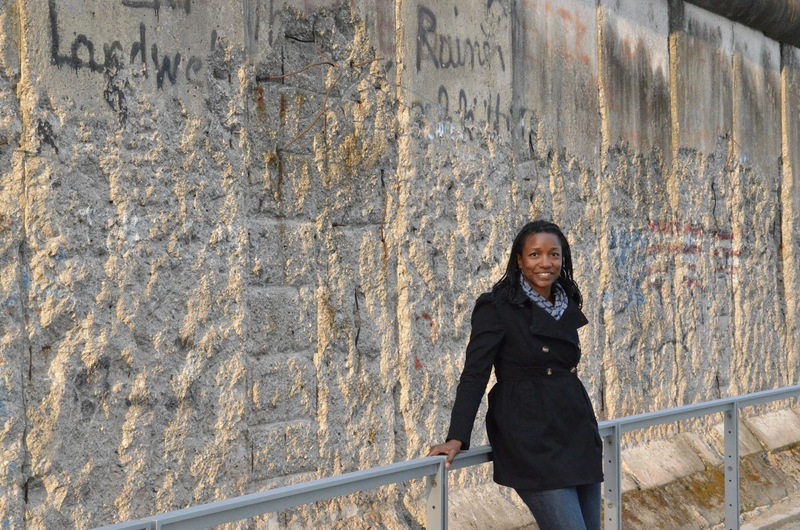 There is a longer piece of the Wall at the famous Eastide Gallery, but it is an inner section. Before the war, this was the site of Prince Albrecht Palace, built in the 1700s. As you can see from the picture above, the Wall ran right up against the ruins –what would have been the front of the building before the Soviet occupation. The place where people are standing in the picture above are the remains of the basement prison cells. Across the street (as seen through the hole in the picture to the right) is the former Nazi Air Minstry Building, which despite its enormous size–it takes up almost a city block on one side–escaped any serious Allied bombing. 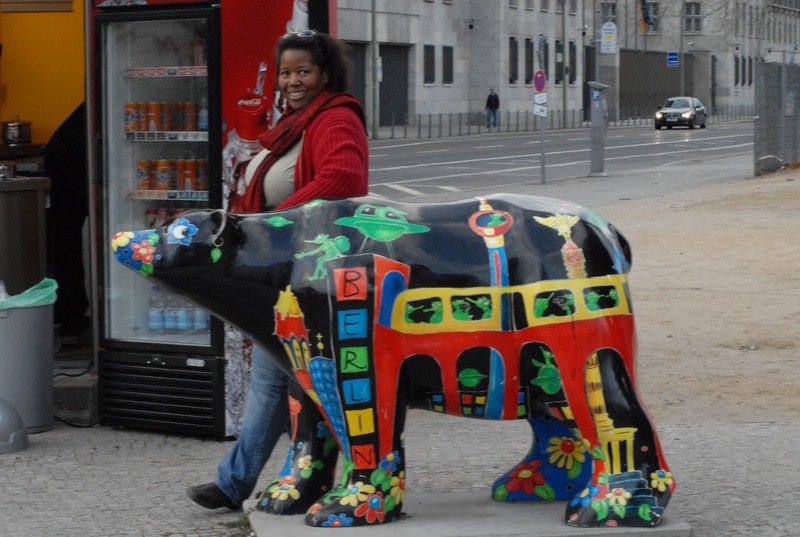 The ‘Buddy Bears‘ are Berlin’s international ‘Ambassadors of Good Will’ ( Buddy Bears painted with various themes can be found all around Berlin). 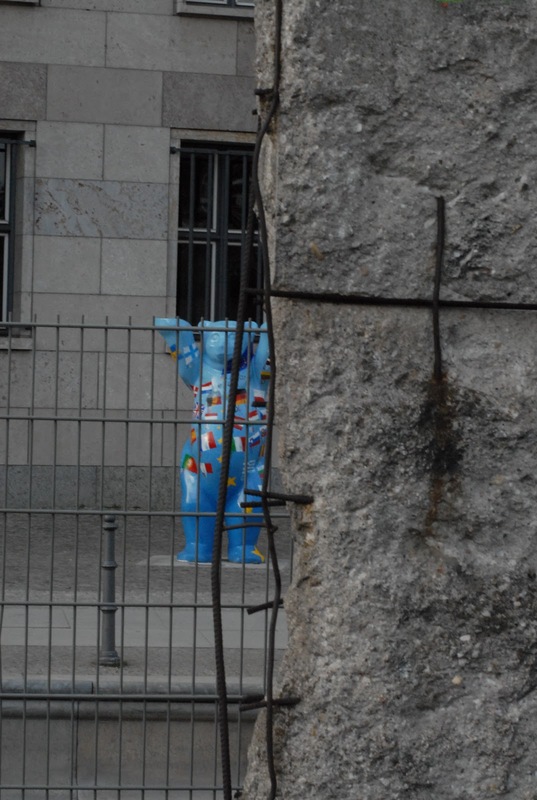 I love the irony my daughter captured in this picture: the juxtoposition of the friendship bear standing between the Topography of Terror and the Air Ministry, seen through the hole in a Cold War relic. This was another loong day of walking. Our next and last sightseeing stop for the day was to head north to the Memorial to the Murdered Jews. This memorial is actually just a block away from the Brandenburg Gate– behind the American Embassy and the Adlon Hotel. So we were back near where we began in the morning. 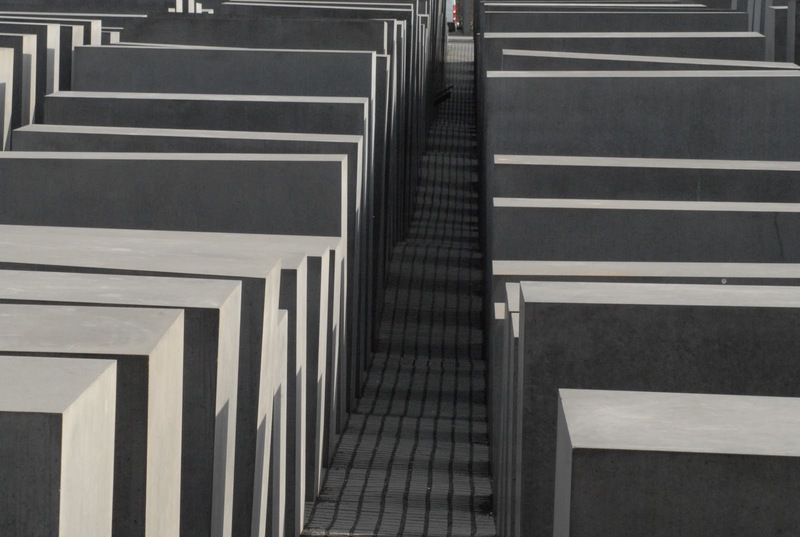 The Memorial to the Murdered Jews is a Holocaust memorial consisting of 2,711 concrete stelae or slabs on a sloped field in a grid-like pattern. One of the unusual things is the square stones differ in height with no rhyme or reason. The architect, Peter Eisenman said this is to give visitors a sense of confusion and uneasiness. The stelae are black and seemingly systematically placed, giving the feeling of a supposedly ordered system that has lost touch with human reason. There is an underground building that houses the names of all known Jewish Holocaust victims. There has been much controversy surrounding the memorial. One in particular was the fact that Degussa, the company that made the anti-graffiti coating for the stelae, had been involved in persecution of the Jews during the National- Socialist period. Add to this, a subsidary of this company had produced Zylon- B, the gas used to exterminate Jews at the gas chambers. In the end, due to costs, the government moved forward with the monument; it was decided that it would cost too much to turn back by the time they discovered the unsavory information about Degussa. Believe it or not, our day was not over. We drove back to the former West side, because I had an appointment to meet with the manager of a hotel in the former American sector. My alumni association, Berlin Brats Alumni Assocation is having their next reunion in Berlin in 2014 to coincide with the 25th Anniversary of the Fall of the Wall celebration. Since I’m also in leadership with the association, I was asked to check out this hotel site for the reunion. We had a very enjoyable visit with the manager. Unlike in the US where business meetings may be followed by discussing details over cofffee, in Germany it is discussed over beer. I bet my Baptist friends will find this a bit unsettling. but happy cuz Ich liebe Berlin! Anyway, after our meeting, because we are gluttons for punishment, we decided to stop by my bestie’s house. 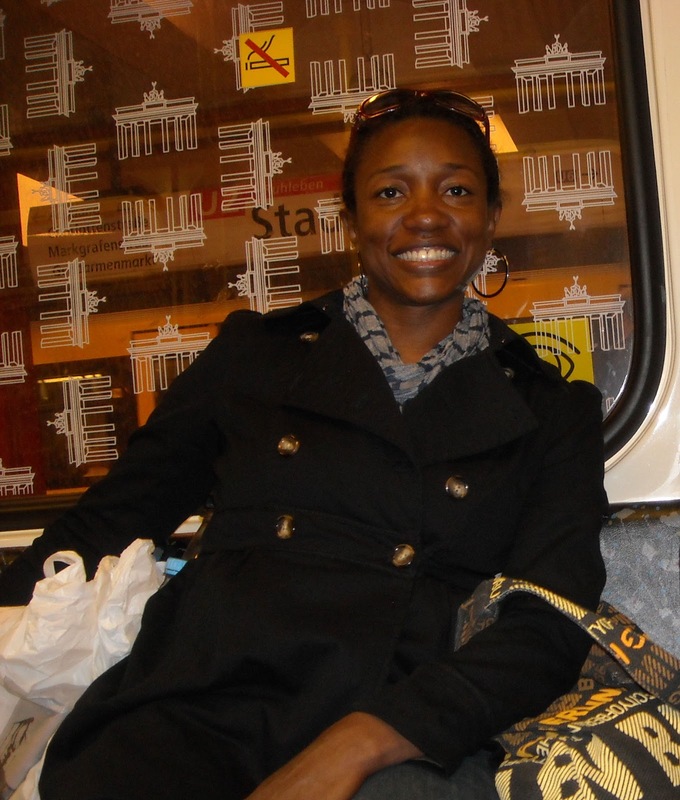 However, since it’s so hard to find parking, we took the U-bahn (Berlin’s subway system) from a few stations down from his house. We already had plans to have lunch with him and another friend the next day, but when he found out we were going to be in the area, he wanted us to swing by anyway. The picture to the right is me on the U-bahn on our way to his house. 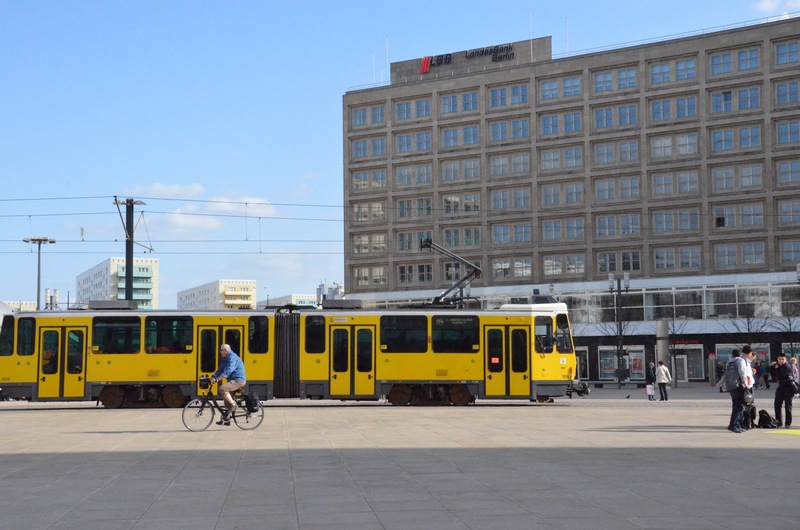 Next post is Day 14 (our last day in Germany) and it was the day we spent sightseeing in the former West Berlin area. Very nice article and photos! Nice to read that you had a good time. Keep up the good work! My Book is Now available on Amazon.com! Share book reviews and ratings with Yoshika, and even join a book club on Goodreads. © Yoshika Lowe and momentsinthelife.com , 2011. Unauthorized use and/or duplication of this material without express and written permission from this site’s author and/or owner is strictly prohibited. Excerpts and links may be used, provided that full and clear credit is given to Yoshika Lowe and momentsinthelife.com with appropriate and specific direction to the original content. momentsinthelife.com by Yoshika Lowe is licensed under a Creative Commons Attribution-NonCommercial-ShareAlike 4.0 International License. Based on a work at https://momentsinthelife.com/. Permissions beyond the scope of this license may be available at https://momentsinthelife.com/contact-me/.